Sunday September 29th, Ingram's 5th Birthday Party and Team Ingram Kick Off Party!!! Well, who needs a weather man to know when it's going to rain? Not us, we just schedule Ingram's birthday party and there you go...We had rain all during the night before, all morning before, and all during the party! But the kids didn't seem to mind; they were getting wet in the pool swimming, so why not get wet on the obstacle course too? They even got out the water hose once they realized how much fun it was to slide and climb in the rain that they added even more water so that they could make a big splash. Oh those crazy kids had tons of fun slipping and sliding up and down the inflatable thingie and it's amazing that no one got hurt! On the pool side of things, it's amazing that no one got hurt there too. We had kids from ages 4 all the way up to 14 in the pool and everyone was swimming, jumping, and flipping all over the place. We heated the pool to a warm 90 degrees (whopping electric bill to come), but it was worth it to see all the kids swimming around with steam coming off of their heads. They even used the pool to warm up after playing on the bouncer and running around in the rain. We met some of our new Team Ingram runners and got to talk about fundraising stuff with them. Speaking of Team Ingram, we also unveiled our new Team Ingram video that the kids made with Dean Studios! I have to say it was great, but then again I'm a little biased of the three cuties that starred in it. Don't worry, we will release it very soon (hopefully within a few days) on You Tube and Vimeo and even attach it to the blob and on the www.kidsconqueringcancer.com website. Since everyone was out of the pool already, we sang Happy Birthday to Ingram while he was standing on the kitchen counter so that everyone could see him. That crazy kid remembered standing up there last year for his birthday song and climbed up again on his own to watch everyone sing to him. The house (and yard and pool and driveway) was filled with friends from school, from church, from the neighborhood, and from Team Ingram; Mr. Shadyac and his wife also stopped by and Ingram was sooo excited to see them! Ingram kept one of his invitations with him and gave it to him Friday morning at the breakfast we spoke at with him and Mr. Shadyac told him he would try to stop by for a bit. Ingram is still talking about "Mr. Shadyac came to my birthday party" all day long. We had a special Green cookie cake, all sorts of cupcakes, Ingram's favorite pretzels and cheetohs, and the best popcorn possible!! G-Daddy helped start up the giant popcorn machine and then quickly took over popcorn duty before he had to leave for the airport. Instead of presents for himself, Ingram wanted everyone to bring art supplies for the kids of St. Jude because that's one of his favorite things that we do while we're there. I think that each time we were inpatient, Ingram came home with a special art project and we still have them all, not to mention all the smaller arts and crafts that he and the girls did on regular appointment days. Our living room was overflowing with art supplies; friends brought stacks of canvases, bottles of paint, piles of paintbrushes, glue sticks, crayons, coloring pencils, markers, coloring books, and art project boxes!! Seriously, we have the best friends and the kids at SJ are going to have soooo much fun thanks to them! When we were getting ready for this year's party, I couldn't help but think about last year's party. There were a lot of similarities between this year and last year like it raining, lots of the same people, the birthday song, and of course feeling the love of everyone. But there was one major difference: Ingram. 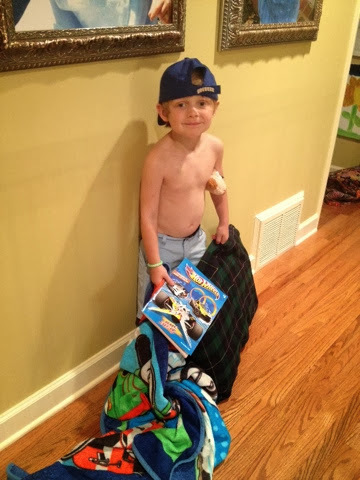 Last year during his party, Ingram didn't much energy and he moved around very slowly; the day before his party on September 29th, 2012 our whole family checked out of being inpatient at St. Jude after completing his last round of chemotherapy. Even the whole morning before his party, we were in the Medicine Room getting his last Peg shot (chemo count recovery shot) and some other things before we headed back to the house. During his party last year, Ingram sat on the kitchen table (opening presents) for most of his party except for a little bit of time when he jumped in the bouncer and hit the pinata! We're so thankful to be celebrating another birthday with Ingram this year, and can't imagine the feelings of the parent's not getting to celebrate with their children on their birthday because they lost their battle with cancer. Ingram said that he felt so special having so many friends at his birthday party. Honestly, we feel special just to be Ingram's parents and to have such great friends and family that have helped us so much along the way. But we are more than grateful that God has given us another year with Ingram. Hoping To Inspire Folks From Last Years' Race Signs! Displaying Our New T-Shirt Design, Some Facts, And The Cutest Little Hero We Know! What Better Way To Start His Birthday Fun After Church Than Chasing His Girls?? The Girls Discussing If They Can Make It Over The Top In One Leap! Not To Worry...We Made Sure They Didn't Do It Once Everyone Else Was There! It Didn't Seem To Matter! There Were Way More Kids Than This In The Pool At Once!! Yep Still Raining But At Least We Got Out Our Soccer Tent! And Not Get Run Over By The Big Kids! Watching This Years Team Ingram Video For The First Time! Part Of The Folks Watching The New Video! Singing To The Birthday Boy After He Assumed His Spot On The Counter! He Loved Blowing Out His Number 5 Candle!! The Big Kids Were In The Driveway Playing On The Obstacle Course! Innocent Fun...Until You See Lindsey And Madison Trying To Make Grey Fall! And Going To Each Other's Birthday Parties! For Another Cute Party Picture Of This Duo! Monday to Saturday September 23rd to 28th, Can't Slow Down Ingram! Wow...Talk about a busy week!!! I'm not sure if we can capture how busy this week was but were going to try. Instead of taking it easy and sleeping in after our crazy fun soccer weekend, Ingram headed to see Dr. Ellis (the best pediatrician ever in case you didn't know) about yet another lingering sinus infection and a couple boo boo's that are giving us trouble healing. It turns out that our little man has grown quite a but too...44 pounds!! Once we figured out how we needed to Ingram better, it was time to head over to Chili's for St. Jude Profits Day and we had a ton of fun. Not only did we have lots of fun at lunch, but we also met several of the Chili's staff and told them about Ingram. He Did It All By Himself...Especially The Letters! Tuesday Ingram went to school and had a super fun day focusing on the letter "S" and the number "2" with all of his friends. When it was time to rest, one of his friends said that he didn't like rest time. Ingram, in all of his witty words, said that he likes rest time because "I just lay on his mat and stare at Mrs. Williams the whole time!" Needless to say, nap time might not ever be the same in his class. We don't know what to do at night if we're not on the soccer fields, so we headed to Lindsey's game and Ingram played with his friends for a while and also managed to cheer for Peanut before we headed to pick up Madison from her practice. Wednesday was another fun day at school followed by more soccer, but this time it was to cheer on Madison! Not only did he get to run around at the fields and okay soccer, but he also got to play lacrosse with his favorite 8th grader Ames. I guess we can add lacrosse to Ingram's list of sports that he loves...baseball, soccer, basketball, tennis, and now lacrosse. Ingram And Ames Once Again Playing Lacrosse At The Soccer Fields! Thursday Ingram had a lunch date with the fabulous "Ladies of St. Jude" and he let me and Mimi tag a long. No joke...he had lunch with about 40 women and they all wanted to talk to him. It was such a fun lunch (despite the air conditioning being broken) and we got to tell our story to all the women. It's always good when we get to talk to financial donors, but these women are actually at SJ all the time and we've done lots of arts and crafts with them and they're amazing!!! And here we are talking to them about how they've helped us at SJ. Ingram Getting Introduced By Mrs. Patty Williams To The Ladies Of St. Jude! His Nametag Read "Ingram The Conqueror!" ﻿﻿Friday morning Ingram and I headed out to SJ bright and early to have breakfast with Mr. Shadyac, some of the ALSAC crew, and some new business leaders that have recently partnered with St. Jude. Ingram was so excited about getting to see Mr. Shadyac that he didn't complain when I woke him up from a sound nights sleep! As soon as Ingram saw Mr. Shadyac, he invited him to his birthday party and got super excited that he said he was going to make it. During the breakfast, we got to tell our story along with Miguel (who is another patient and now works for ALSAC!) to everyone there and we also answered questions. Ingram was such a trooper and did a great job; he even joked around with Mr. Shadyac while he had the microphone! After we spoke, we went to see our friend Brent Jr. and his mom Jill who were inpatient starting a new round of fighting Neuroblastoma; keep them in your prayers because it's been said to be tougher fighting the second time because you know what all to expect. Mimi came to SJ and picked up Ingram and they went to lunch while I stayed all day for meetings before heading home to have fun with the kids. Daddy was back in town from a work trip and G-Daddy was also driving in from Texas for a couple days. And Apparently It Couldn't Wait! I'm Not Sure Who's More Excited...G-Daddy, Ingram, Or The Girls?? Saturday morning G-Daddy took Madison and Ingram on a walk to the donut store over a mile away and the kids loved it! G-Daddy learned that Madison's "shortcut" wasn't really a shortcut, but at least it took them through the park on the way home. After riding his scooter and bike for almost 3 miles, Ingram made it to the soccer fields and Daddy got to watch him play soccer for the first time this year! Ingram and his Purple Puma Happy Feet friends had fun practicing and then playing in their game; Ingram even loved his water breaks and especially loved chasing his coaches when they were playing tag with the soccer balls. After his soccer game, we headed over to Annabelle's house for her birthday party to celebrate with Barbie. It was pretty funny to watch all the boys running around like crazy kicking balls and playing in the ditch while all the girls were playing and running around in their Barbie dress up clothes. Oh I miss that age with my girls, but am so glad that Madison was with us at the party; it was sweet to watch her play with the little girls and see a little of the "little girl" in our "grown up middle schooler." The rest of Saturday was spent getting ready for Sunday's party and hanging out with G-Daddy. Ingram even got to open his first birthday present...his own set of golf clubs!! Yep, real clubs are now in Ingram's possession and now we are in trouble! Ingram Running Down Field To Score A Goal! "Ingram, How'd You Score That Goal?" Not Realizing That Daddy Was Recording Ingram, I Said "He Kicked It In!" Not The Answer Daddy Was Looking For, But Ingram Totally Agreed With Me! Ingram Started A Balloon Pop Contest! Yes It's Dark, But We Are Too Excited To Go To Bed! Why Not Decorate The House...In The Dark??? Ingram, G-Daddy, Daddy, Madison, Lindsey, And Even Beau On The Balcony! Monday to Sunday September 16th to 22nd, "F" Means Fun! This week has been pretty typical around the Dismuke house...crazy busy!! Ingram wanted to make a trip to see Daddy at work and take him lunch so we made a quick trip to Chick Fil A. When Ingram opened his kids meal, he had a Giraffe book as his toy and we immediately started talking about how much one of our St. Jude friends Ashlynn McClure LOVED giraffes! We even came up with an elaborate plan on how she's playing with all the giraffes in Heaven; once we make a friend at St. Jude, they're always our friends even if we don't get to see them for a long long time. Ingram Making His Best "Long Tongue" Giraffe Face! After Ingram went to school on Tuesday, he took Madison to lacrosse practice and decided to impress all the gals with his rock star body! He was so excited when he saw Ames (brother of Madison's friend Maren) that he took off running from the car before he even put on his shirt. Have we mentioned that half the time, we're doing good to have shorts on him?? He's loving the fact that boys don't have to wear shirts all the time! Stud Muffin On The Premises! Wednesday was another fun day at school and then the soccer fields! After Ingram dressed head to toe in his Florida colors to learn the letter "F" at school, he continued his learning at the soccer fields by playing football and monkey in the middle all while he's still in his Florida outfit (as he calls it). Learning The Letter "F" with Florida Gator Colors And A Florida Gator Football! And Of Course, A Funny Sister "Fotobombing!" Football With Daddy At The Fields! Fooling Around With The Boys Playing Monkey In The Middle! Thursday was "Show And Tell" at school so guess what he took? Yep, his Florida Gator Football and no one got hurt with it! We also continued our "F" lessons into the night and on Friday with some fun time with the girls since they were out of school on Friday. Ingram had lots of fun with the girls and their friends playing at home, running around the neighborhood at night (literally), playing Wii Car with the boys and girls, and having some late night fun in the pool! Ingram Trying To Talk The Girls Into Making A Bow For His Hair! It Took Two 6th Graders To Block Ingram!!! Friday turned out to be Fantastic Friday as we all packed and headed out to Franklin Tennessee; it was the first time with the whole family has hit the road for a soccer tournament. We decided that playing in Jackson last month didn't count since we're there all the time and we didn't spend the night, but this time Lindsey's team was booked at a hotel for 2 nights and it wasn't possible to drive back and forth between the games. Ingram had been talking about going out of town all week and finally on Friday we told him it was time to leave. He went upstairs and got his pillow and blanket and his crayons and coloring book and said he was ready to go. Then he went back to get a little stuffed animal and was really ready to go! Needless to say, he ended up taking the blanket, colors, and coloring book, but we added little things like clothes and shoes to the mix so that he wouldn't freeze in the cold morning games. All Packed And Ready To Go To Franklin!! "Am I Missing Anything Daddy?" We had a great time traveling with Lindsey's team and Ingram loved being the only boy for most of the time! During the games, he played with Madison, cheered for Lindsey, and kept all of the adults entertained with all of his tricks and silly things that he would say. He loved it when we out to lunch and dinner with everyone because he got to sit with all of the girls; we're going to have to remind him about this when he's older! The five of us were in a small hotel room and Ingram slept on a mattress on the floor for two nights. You'd think that with going to bed after 10pm each night and getting up at 6am each morning would make for a tired bunch, but there's something about everyone being in the same room trying to sleep that makes the giggles come out several times when we're trying to go to sleep! Each night, probably after the 4th or 5th outburst of laughter, Daddy would say "Kids" in a way that we all (yes I'm including myself in this) would finally get quiet and really try hard to drift off into sleep. The girls did great at the tournament and held their own against the number one team in the state to finish 3rd in the Battleground Tournament. Ingram Sound Asleep (Finally) After Two Hours On The Road! And Yes, He's Covered From Head To Toe In His Blanket. Ingram And All The Girls Fascinated By The "Tortilla Lady"
Making All The Fresh Tortillas! You Try Putting Them To Bed When They're Full Of The Giggles!! The Ringleader Of The Laughs!! The 04 Lady Lobos Rush Smiling For The "Official" Picture Lady! Nothing Like Dinner Time Craziness At Steak And Shake! Peanut Sending The Ball Downfield! Playing Against The Number 1 Ranked Team In Tennessee! After leaving the tournament, we stopped in Jackson to have an early birthday lunch for my sister Amye and the kids loved hanging out with their cousins for a couple hours. At one point, all five of them had pillows strapped to themselves with belts so that when they purposefully crashed into each other, it wouldn't hurt. I'm not sure who invented the game, but Ingram came to tell us that he ran into Brett one time, but it didn't hurt because of all the pillows strapped on him. We all busted out laughing and they continued to cause chaos around the house for a little while longer! But we had to eventually leave so that the kids could get the ice cream we promised them after the tournament was over. It only took 6 hours to get, but it sure was good!! Finally Feeling The Baskin Robbins Love! 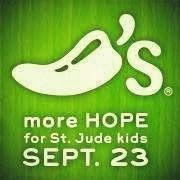 Since this is Childhood Cancer Month, all the Chili's Bar and Grill Restaurants all across the nation are having a special St. Jude day on Monday September 23rd! All day long, whether you dine in or carry out, all of the proceeds will be donated back to the hospital as part of their partnership with St. Jude. They also have the fun coloring sheets where you can "Create A Pepper" and they'll hang them on the wall of the restaurant if you want. We were there last year right before Ingram went into the hospital for his last round of chemo and we will be there tomorrow as well at our local Chili's. I guess you'll have to wait till later to see if we go for lunch AND dinner!